Leaves alternate, triangular (deltoid), coarsely toothed, tip pointed, base broadly truncate, those of short shoots 8-14 cm long, 8-14 cm wide, with 2-5 glands at base, leaves of long shoots variable, to 20 cm long, leaf stalk flat at top. 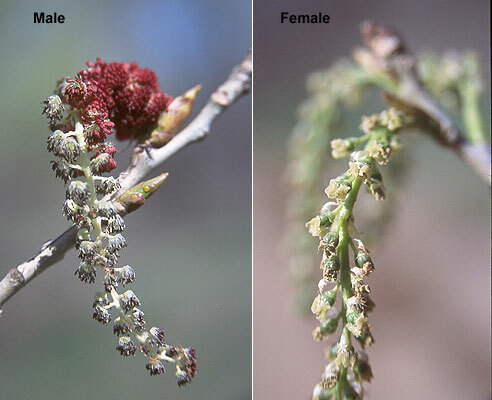 Populus deltoides.male and female inflorescences.Landscape Plants Oregon Stte University.landscapeplants.oregonstate.edu (Accesed 2/2017). 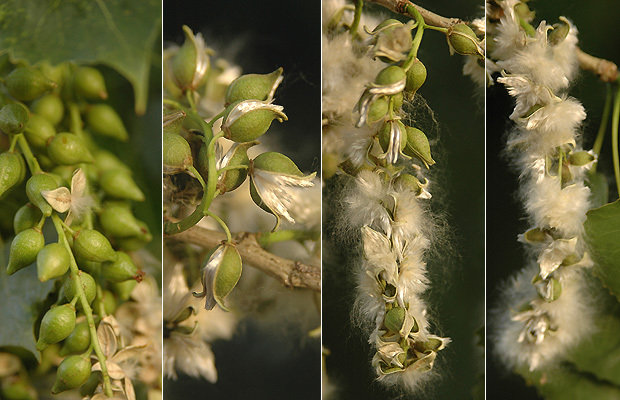 Flowers in catkins, blooms before leaves expand, sexes on separate plants (dioecious); males flower first, catkins about 10 cm long, reddish, female catkins about 22 cm, wind pollinated, March-April. Fruit dry, an egg-shaped 0.6-1 cm long, seeds tufted, wind dispersed to about 100 m, or carried by water, May-June; germinate soon after falling. 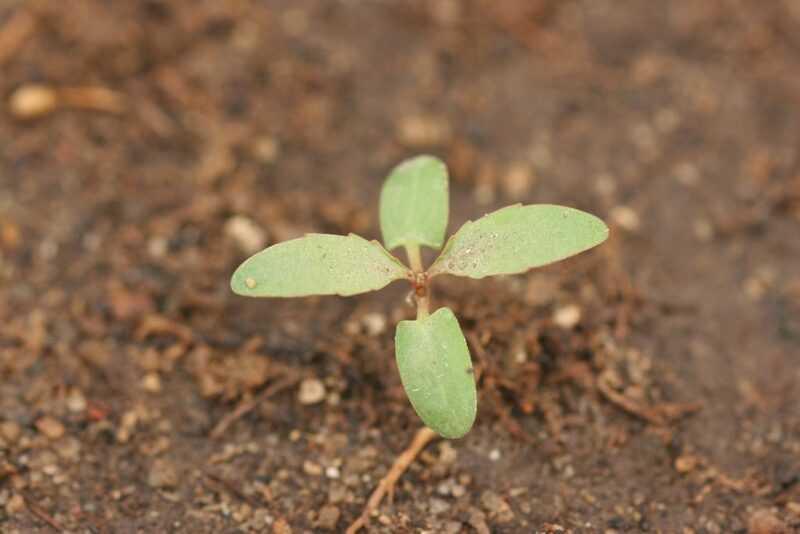 New seedlings require high moisture and full sun. Buds and catkins eaten by some birds (Martin et al. 1951). Populus deltoides.seed release series.Oregon State University.Landscape Plants.landscapeplants.oregonstate.edu (Accessed 2/2017). Habitat: Open, moist fill and disturbed areas and flood plains. Tolerates salt and pollutants. Very intolerant of shade. Needs more than 1% full sun to grow (compensation point) can use up to 75% full sun to photosynthesize (saturation point) (Hicks and Chabot 1985). Moderately flood tolerant. Soil pH 4.6-6.5 (USDA, NRCS 2010) Found in soil pH 7.6 (Gargiullo unpublished data). Seeds eaten by numerous birds and small mammals (Martin et al. 1951). Populus deltoides.seedling.Jackie Smith Diagnostic Technician MSU Diagnostic Services.pestid.msu.edu (Accessed 2/2017). 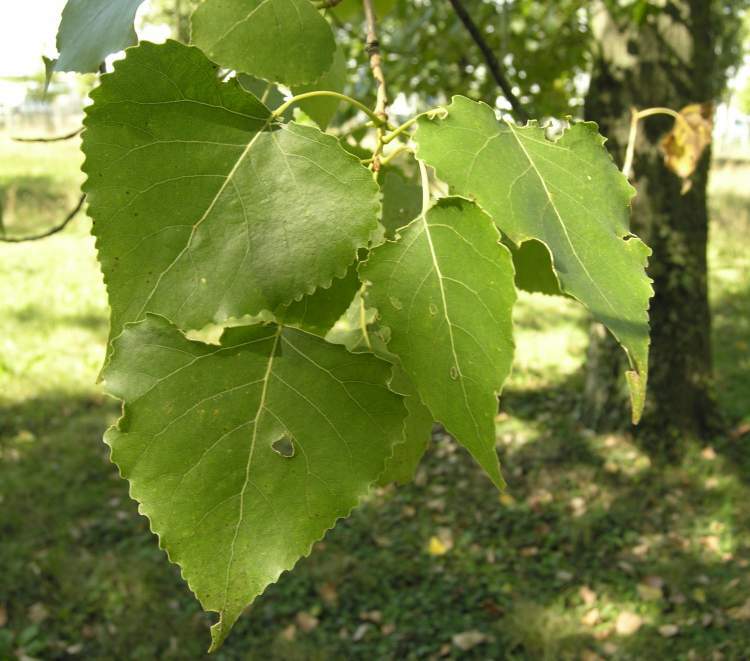 Populus deltoides.Andrea Moro.luirig.altervista.org (Accessed 3/2016). 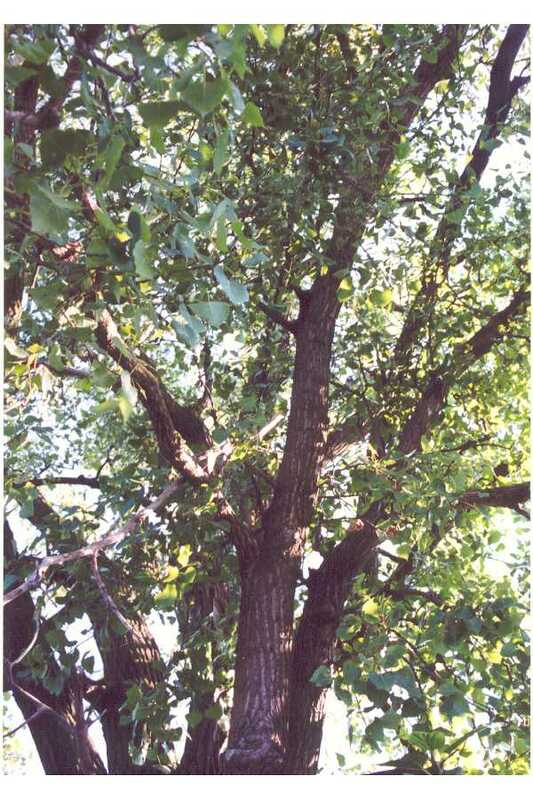 susceptible to wind damage by weakening trunks, allowing entry other of borers and fungal pathogens. The adult is a dull, gray long horned beetle to 3 cm long. Both adults and larvae of Plectrodera scalator (Coleoptera, Cerambycidae), the cottonwood borer cause damage. The larvae bore holes into wood of the root crown weakening the trunk. The adults are black and white checkered long horned beetles to 3 cm long. They eat leaf stalks and bark of new shoots. Blackened, hanging shoot tips are a sign of this insect. Another wood borer is Cryptorhynchus lapathi, (Coleoptera, Curculionidae) the poplar-and-willow borer, a European hidden snout weevil, now well established here. The adults feed on green bark, but do little damage. Larvae feed on the inner bark of larger stems and tunnel up through trunks which may kill small trees (Burns and Honkala 1990; Sinclair et al. 1987; Johnson and Lyon 1991; White 1983; Covell 1984). A host tree of the Asian longhorn beetle, Anoplophora glabripennis (see Norway maple).